Call today for Professional Non-Poisonous-Snake Trapping and Non-Poisonous-Snake Removal Services. If you have Snakes affecting your home, business, or exterior property you have come to the right place for professional help. We are professional snake trappers or wildlife control technicians. Our main line of work is to remove snakes that enter into man made structures or cause problems on a property. 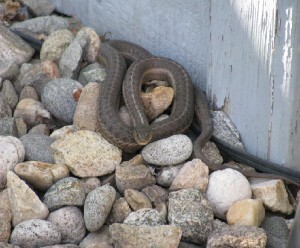 Some examples are: Female Snakes that den up to have there young in crawl spaces or wall cavities. Snakes may enter a wall cavity or ceiling where they bare there young or den up for the winter. As the young snakes develop they will enter into living areas. Snakes will enter under a porch or a crawl space to bare there young through an opening that a rodent has created, and sometimes die causing tremendous odor problems and contaminating the inside of a building. Snakes like rodents, will often infest a building for years causing the building to lose its value, while creating health problems. We use the most current snake live trapping techniques, cleanup, and block out methods. If you have a snake problem, contact us or give us a call to hire our professional coaching, or snake removal services. Despite their reputation for the contrary, most snakes in the United State are not poisonous. In fact, of all the many species in the country, only a few are actually potentially harmful; rattlesnakes, copperheads, cottonmouths, coral snakes, and sea snakes. For the most part, snakes aren’t highly adaptable creatures and require a specific habitat in order to survive. Smaller species often live underground, while others, like green snakes make their homes in trees. In generalities, snakes prefer dark, cool and damp places where food is readily available. Although there isn’t an absolute pattern for snake infestations, there are areas that seem to be more attractive than others. Firewood that is stacked directly on the ground, old lumber piles, flower beds and gardens with an excess of mulch, disorderly basements, junk piles and barn lofts. Barn lofts are especially appealing when stored feed attracts rodents, as are attics with rat or mice control problems. Pond and river banks–especially when there are boards, tires and other items in the surrounding area, additionally with unmowed lawns and abandoned lots are also alluring to snakes. Every snake is a predator, but diets may widely vary depending on the species. Rat snakes for example, as their name would indicates, eat primarily rodents, baby birds and eggs. Some snakes eat primarily insects, while other smaller species, like earth snakes and worm snakes, eat earthworms, slugs, and salamanders. Water snakes eat primarily frogs, fish, and tadpoles. Aside from frightening people, nonpoisonous snakes are completely harmless and tend not to cause damage. Once a snake or a group of snakes is identified as non-poisonous, most methods for removal are inexpensive and fairly non-invasive. Regardless of whether or not they are harmful, most are uncomfortable when snakes take up residence in their living area. When non-poisonous snakes become a pest control problem on your property, professionals in your area with a well established set of techniques for removal can help you to control the animal’s population and assure that they won’t come back. Click here for assistance in resolving your Snake Control (Non-Poisonous) issues in a friendly, safe and efficient manner.